The Singapore Summit was a dramatic turn-around from the adolescent name calling that Trump and Kim had engaged in only months before. Trump had labelled Kim as “Little Rocket Man,” and Kim had labelled Trump as “Dotard.” Having gotten through this, the summit was on for June 12, then it was abruptly cancelled by Trump when Mike Pence had referred to the “Libya model” for North Korean nuclear disarmament, and a North Korean official had called Pence a “political dummy.” North Korean officials were understandably sensitive to the Libya model reference. They view Gadhafi’s demise as a direct result of his giving up Libya’s nuclear program. Then, in the midst of the chaos, something happened behind the scenes and suddenly the summit was back on for June 12, as originally planned. The most obvious result of the summit was the change in tone in the relationship of the two men. Whereas the tone had once been nasty and threatening, it was now warm and friendly. The two men appeared to genuinely like each other and be comfortable in each other’s company. For both, the new warmth of their relationship seemed likely to play well with important domestic constituencies. Although the summit elicited a lot of skepticism from US pundits, the optics were those of a breakthrough in a relationship once considered dangerous and a possible trigger to a nuclear conflict. Both men viewed the summit as a major achievement. 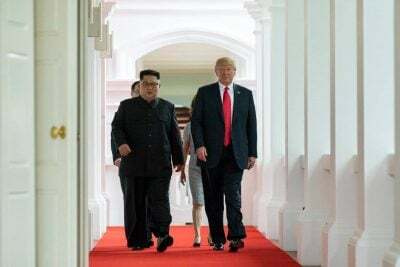 They each committed to a rather vague Summit Statement, which said in part: “President Trump committed to provide security guarantees to the DPRK (North Korea) and Chairman Kim Jong-un reaffirmed his firm and unwavering commitment to complete denuclearization of the Korean Peninsula.” Trump added as an unexpected sweetener that he would put a halt to the joint US-South Korean war games, which the North Koreans had long complained were highly provocative. There was much, however, that didn’t emerge from the Singapore summit, and it can be summarized in a single word: “details.” The ultimate value of the summit will be found in the details that are agreed to and acted upon going forward. Will these details build or destroy trust? Will Kim truly believe that he can trust Trump (or a future American president) to give security to the Kim regime? Will Trump (or a future American president) truly believe that Kim is following up on denuclearizing? The answers to these questions will depend upon details that have yet to be agreed upon, including those related to inspections and verification. While the summit has relieved tensions between the two nuclear-armed countries, nuclear dangers have not gone away on the Korean Peninsula or in the rest of the world. These dangers will remain so long as any country, including the US, continues to rely upon nuclear weapons for its national security. Such reliance encourages nuclear proliferation and will likely lead to the use of these weapons over time – by malice, madness or mistake. We can take some time to breathe a sigh of relief that nuclear dangers have lessened on the Korean Peninsula, but then we must return to seeking the complete abolition of nuclear weapons. An important pathway to this end is support for the Treaty on the Prohibition of Nuclear Weapons, adopted by the United Nations in 2017 and now open for state signatures and deposit of ratifications.